TigerDirect was originally founded as Tiger Software which was a publisher of titles for both Windows and Apple computers, but renamed itself as TigerDirect when the company began selling build-it-yourself PCs. In 1996 TigerDirect was acquired by Systemax, Inc. and has everything from computers, cameras, cell phones, video games and more. 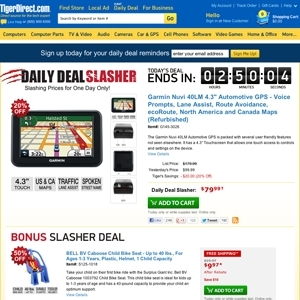 The TigerDirect 'Daily Deal Slasher' showcases a new item every day that is marked at the "lowest price possible". Tigerdirect.com currently ranks #13 amongst sites offering online deals -- Sport.Woot ranks #12. In the Computers and Electronics category, TigerDirect ranks at #3 -- Tech.Woot ranks #2.